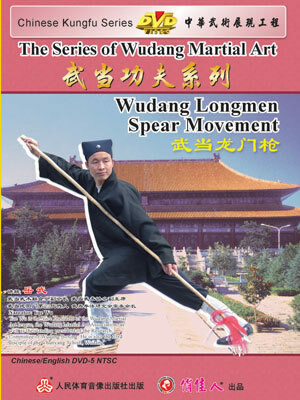 Wudang Longmen Spear Movement is the only secretly passed-down Speared-movement in the Wudang martial art discovered by far. It used big spear in the past. According to the record, the spear was nearly 4 meter long. And the great master Xu Benshan of Wudang was good at this movement. At present, it was nearly failing to hand down. Yet, Yue Wu learnt it at the end of last century. The movement emphasizes swift spear, strong attack, powerful stir, heave split and sharp spear. And it has 13 ways. While performing, there are distinct alternates between action and still, and the presentation of hard and soft is unique. The movement is simple and smart. When moving and revolving, the waving red-tassel seems to cover the sun, and the sharp end flashes like white flowers in the rain. It reflects the special fascination of Wudang martial art. In the Wudang martial art, this movement mainly focuses on increasing personal strength and defense application secondarily. If practicing frequently, one can enhance its power of waist, leg, arm and wrist, as well as use its strength more freely. It would be beneficial for those who practice internal cultivation to learn this spear movement. Meanwhile, for those who want to keep fit, the movement is easy to teach, to learn and to apply. It is convenient to practice.